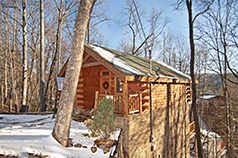 Whether you're looking for a romantic honeymoon cabin, a family vacation cabin, or a big cabin for a group, our cabins are as luxurious as they are affordable. Great mountain views, warm, wooden interiors, and convenient access to the best area attractions are yours. You will love this beautiful cabin in Sky Harbor Resort. Gatlinburg and Pigeon Forge are at your fingertips where you can enjoy attractions, shows, gift shops, and amazing restaurants. The cabin features custom handcrafted log furnishings, vaulted ceilings, hardwood floors, and tongue & groove log walls. The warm earth-tones of the décor invoke the rural landscape of the surrounding Tennessee Smokies. Enjoy movies on the 42" Plasma HD flat screen television with built in surround sound. 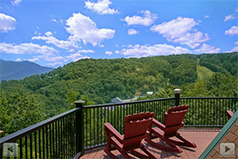 This 5-star Gatlinburg cabin with home theater provides some of the most beautiful views of the Smoky Mountains from its large decks. Imagine yourself basking in the warmth of your family-sized hot tub as you take in some of the most fantastic sunrises and sunsets in the Smokies. Not only will you have easy access to unique local artisan workshops, roadside cafes, and bakeries, you are only minutes from downtown Gatlinburg with its many attractions, unique shops, and many wonderful restaurants. Definition of romance — a stay in a spectacular Smoky Mountain luxury chalet with magnificent views of Gatlinburg and the majestic Smoky Mountains. Queen Margaret offers just that. 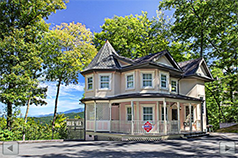 This gorgeous Victorian offers regal elegance, inside and out. With luxurious furnishings and large windows in each room, you will not find a more elegant chalet in Gatlinburg. Enjoy all Gatlinburg has to offer and, at the end of the day, view the lights of downtown Gatlinburg from your deck. Your Jacuzzi will provide a soothing bath as you view breathtaking views from the wrap around windows. 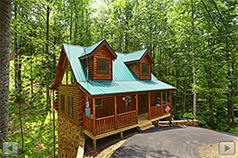 Call up your friends and let them know you found a fabulous Gatlinburg cabin for your group retreat or couples getaway. 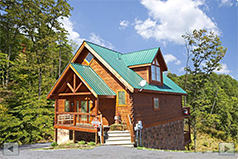 With a breathtaking view of the Smoky Mountains, this luxury 3-bedroom Gatlinburg chalet offers mountain views and downtown views. Plush king and queen size beds, leather furnishings, flat screen televisions, beautiful gas log stone fireplace, two rain head showers, pool table, fully equipped kitchen, and an outdoors picnic area makes this a winner! 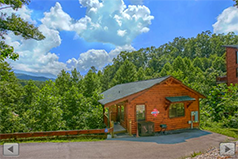 Tell the family to pack their bags -- you're headed for a great Gatlinburg cabin in a prime location near downtown Gatlinburg. Bring some steaks for the BBQ grill, swimsuits for the resort pool and hot tub, and lots of energy to enjoy Great Smoky Mountains National Park and its outdoor adventures. The game room in this cabin is awesome, and the cabin's interior boasts a unique country charm. 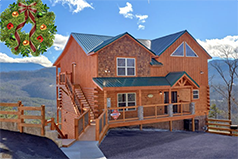 Bring your family to beautiful Summit View Resort to stay in "Simply the Smokies!" This 4 bedroom cabin rental comfortably accommodates 12 guests, making it an ideal cabin for getting away with your family or getting together with a great group of friends. Enjoy a stunning view, great cabin comforts, and a special 15% discount when you book your resort cabin online. From your cabin's private theater room with a 70' television to the outdoor hot tub to the fully-stocked game room with a pool table and multi-game arcade game, there's plenty of ways to relax and unwind in this 5-star cabin. "TrinQuility View" is ideal for a family vacation or a fun weekend in the mountain with friends! Once you're ready to get some rest, you can look forward to sleeping in one of this cabin's 5 bedrooms that each comes with a full bath. 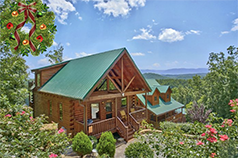 Enjoy a couples' getaway or a family vacation in this secluded mountain cabin. Located between Gatlinburg and Pigeon Forge, you can enjoy the best of what each mountain town has to offer — lots of attractions, great restaurants, and tons of shopping opportunities. You don’t even have to leave your cabin to have fun. There is a pool table, foosball table, a wet bar with mini fridge, and the den's big screen television — not to mention free Wi-Fi. You can relax by the gas log fireplace in the winter months and enjoy the family size hot tub any time of the year. 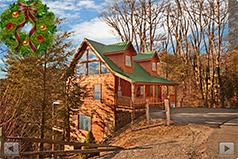 Planning a vacation in Gatlinburg for your group, family reunion, business retreat or special occasion? You have found the perfect cabin for your getaway. 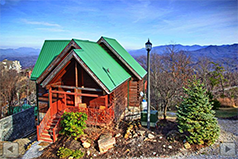 You will be close to downtown Gatlinburg in this Chalet Village Resort cabin. A game room comes complete with wet bar, 55" TV, wood burning fireplace, and 2 sleeper sofas. Chalet Village Resort also has 3 clubhouses with seasonal swimming pool access, tennis courts, and more game rooms.